Linear irregular vessels – cite! Linear irregular vessels (message) Linear irregular vessels – participate! Linear Irregular VesselsThis glossary term has not yet been described. Linear irregularlinear vessels with multiple bends or serpentine vesselslinear irregular vessels with multiple bends. Seen with flat BCC and melanoma are red vascular structuresThis glossary term has not yet been described. with a range of size, shape, and distribution . Linear irregular vesselsThis glossary term has not yet been described. can be identified in melanomaThis glossary term has not yet been described., basal cell carcinomas, and dysplastic neviThis glossary term has not yet been described. . 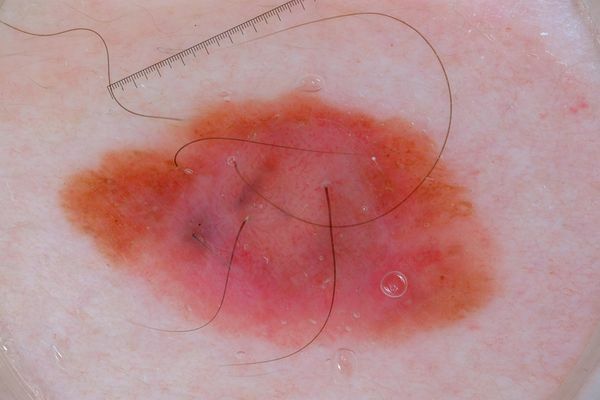 In one study, 33.3% of melanomas had these vessels, with a PPV of 67.6% . In another study of amelanotic/hypomelanotic melanomaThis glossary term has not yet been described. (AHMamelanotic/hypomelanotic melanoma), linear–irregular vessels were seen in 10.3% of thin AHM (<1 mm), in 0% of thick AHM (>1mm), and 0% in amelanotic/hypomelanotic benignis any condition that is harmless in the long run melanocyticThis glossary term has not yet been described. lesions. Thus, similar to dotted vesselstiny pinpoint vessels, the presence of these vessels suggests that the melanoma is still relatively thin. ↑ 2.02.1 Argenziano et al. 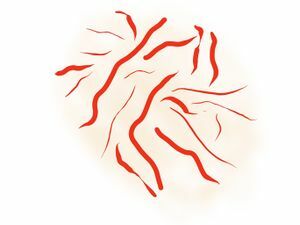 : Vascular structuresThis glossary term has not yet been described. in skin tumors: a dermoscopyThe examination of [skin lesions] with a 'dermatoscope'. This traditionally consists of a magnifier (typically x10), a non-polarised light source, a transparent plate and a liquid medium between the instrument and the skin, and allows inspection of skin lesions unobstructed by skin surface reflections. Modern dermatoscopes dispense with the use of liquid medium and instead use polarised light to cancel out skin surface reflections. study. Arch Dermatol 2004;140:1485-9. PMID: 15611426. DOI. ↑ Zell et al. : Early diagnosis of multiple primary amelanotic/hypomelanotic melanoma using dermoscopy. Dermatol Surg 2008;34:1254-7. PMID: 18554289. DOI. ↑ Pizzichetta et al. : Amelanotic/hypomelanotic melanoma: clinical and dermoscopic features. Br. J. Dermatol. 2004;150:1117-24. PMID: 15214897. DOI. This page was last modified on 16 January 2019, at 21:39.